If you think about all the important things you do to ensure your child’s healthy development, does reading ever make it on to your list? It should. While many of us know that our children’s healthy development depends a great deal on good nutrition, plenty of sleep, and exercise to name a few, there’s less awareness about how literacy can play a role in a child’s healthy development. The word ‘literacy’ means a person’s ability to read and write—but its implications mean so much more. People need reading and writing skills in virtually every aspect of their lives. Without these skills, a person can face serious problems that can affect their health as well as their social and economic outcomes. 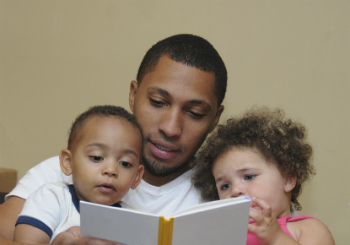 Parents and caregivers therefore play a crucial role in shaping a child’s early reading experiences, ones that lay the foundation for the skills needed later in life. What’s more, early exposure to language—whether through books, words, or songs— can foster warm and nurturing interactions between children and their parents or caregivers. Setting aside a bit of time every day to read or participate in a learning activity with children is crucial to their development. If your family members are not in the habit of reading, anytime is a great time to start. Even just 15 minutes a day can improve a child’s literacy skills dramatically, and can help a parent improve their skills as well. An estimated 55% of working age adults in Canada have less than adequate health literacy skills – that is, the ability to read and understand information about their own health. It is estimated that 5% to 15% of Canadian schoolchildren have reading delays. Most children who have not mastered reading by the end of grade 3 will not catch up, which often leads to failing grades and early school leaving. Make time to read, sing, talk and cuddle every day. Change your voice as you read and have fun with the words. Talk about the pictures in the book and tell your own stories. Have books all over your home - on bookshelves, in baskets, in toy boxes. Visit your local library to find different books and ask about baby reading programs. Read with your children. Children who are learning to read need to practice. If your child is doing well, regular reading at home is a chance for them to show you what they’ve learned. If your child is having trouble, it provides a safe place to practice with someone they trust. Be a role model. Your children should see you enjoying reading. If they see you and other family members reading books, newspapers, and magazines, they’ll learn that reading is important, fun and valuable. Consider creating a special reading place in your home that is quiet and cozy. Keep books in or near this area. If your child has trouble reading, choose stories that they can relate to. Look for stories they know or that offer experiences they understand or illustrations they recognize. Limit screen time. Create time for reading by limiting the amount of time your child spends watching television or playing computer and video games. Opportunities to read are everywhere. Encourage your child to read street signs, the sports pages of the daily newspaper, or even the back of the cereal box! Your child might also enjoy reading non-fiction or comic books. Public Health Agency of Canada. How does literacy affect the health of Canadians? Adult Literacy Survey of Statistics Canada. Ottawa: Statistics Canada, 1995.